It's been a long time since I've read a book by this author. So when I stumbled across this one sitting on my e-reader I couldn't resist the temptation. 'Home the Hard Way' is a mystery with a definite romance thrown in and I love this combination. The story is set in a small town called Palladian. Small towns are another weakness of mine. I grew up in the country and lived about 5 miles outside of a small town and have spent much of my life living in small towns and anyone who's ever spent any amount of time in one knows that the expression 'if you can't remember what you did yesterday, just ask your neighbour' had to of been created by someone who lived in a small town. Truer words were never spoken. Palladian personifies that phrase. Everyone is in everyone else's business. There are secrets and lies, deceptions, affairs all the stuff that small town life is made of. Dare Buckley left Palladian as a teenager shortly after his father committed suicide, but now he's back. For Dare, Palladian has become his last chance at redemption. He messed up big time in Seattle and it seems that in order to fix things he needs to go back to the beginning. Being back in Palladian means a chance not only to fix his professional life but it's also his opportunity to try and find out what drove his father to commit suicide and it means a seeing Finn Fowler again. Finn was just a young kid with a serious case of hero worship when Dare last saw him. Finn's all grown up now and he doesn't need a knight in shining armor to ride to his rescue...Finn has taken control of his own life...total control. So where do I begin explaining how much I loved this book...let's start with Dare. Dare was the golden child, Finn worshiped him, he was Finn's friend, his confidant, his protector, in a way his everything but that was then and now Dare and Finn have both grown up. Dare's a bit of a mess, he spends a lot of time seeking comfort and answers in a bottle where they can't be found and he's slowly beginning to realize that the Finn he left behind doesn't exist anymore and he just doesn't know the Finn that he's come back to. Which brings us to Finn. Yep, Finn grew up and it wasn't an easy thing but he learned the hard way that the person who was going to take care of Finn...was Finn and no one else. He's got secrets that he guards tenaciously but most of them aren't his, they just seem to revolve around him. There was host of secondary characters who added to this small town's character. Each one of them somehow connected to the MCs and each other as is often the case in small towns. People such as Finn's Aunt Lyddie, Bill Fraser who is a story unto himself, Denise, Tony, Trent and so many others. There were just so many pieces to this puzzle. I loved working them in my mind and sliding one piece up against the other to see which ones fit only to discover that there was yet another piece hiding somewhere. I love a good mystery and this one worked for me I was fascinated to see how everything would come together and at the same time seeing Dare and Finn's relationship reshape and reform itself to fit the men they have become instead of the boys they were, was almost another mystery all it's own. My only disappointment was at the end I would have liked just a little more, I'd love even a story to let me know what happens next with Finn and Dare...that'd be really awesome. I love a book that pulls me in and makes me want to be involved, has me waking up in the middle of the night so I can read a few more pages or getting up early so I can finish it and this book had me doing all of that. All that I'm going to add here is that the narrator for this audio book was Shannon Gunn, who happens to be a new to me narrator. If this is any indication of his work and I'm assuming it is, I'm looking forward to enjoying more audio books by this narrator and there are more than a couple of audio books on this narrator's backlist that I'm definitely looking forward to. 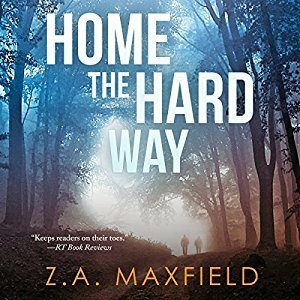 So in summary this one was a definite success, I enjoyed revisiting 'Home the Hard Way' by Z. A. Maxfield and I have found another narrator to add to my list of 'narrators I like' which in turn means...you guessed it my audio book list has magically increased.